Yes, the DeLorean is white. No, it was not crashed. Yes, it has engine work done. No, it doesn’t have something other than the PRV6. You can just see the Petersen poking out in the background there. This fiber special C2 Corvette is too damn cool. The wheels and 240Z headlights just make it even cooler. Yes, it’s not a traditional kind of attractive, but it’s a total period piece. As a bonus, the quality of body work was great. Nismo GTR with a helmet in the passenger seat and a nasty gouge in the rear left quarter panel. Oh, and MFR plates. This is the “GTR Table-spec” edition. Given the usual crowd at these events, I wouldn’t doubt the authenticity of this Speedster. 300SL Roadster! This one has the interesting Euro spec headlights. While most of us have heard of or seen E21 or E30 Baurs, most don’t know that the 1600/2002 were also done up by Baur! These would be worth a hell of a lot more if they weren’t FWD. The most epic Supra engine bay ever. Everything was custom tucked and shaved and built specifically for this car. Everyone getting totally bewildered while the owner told us about the build process. Caterham/Lotus/Something Se7en! The nose piece and rear fenders were carbon fiber. Let’s see if anyone can name this...the car next to it should be a hint. Mexico Blue 356 with a Mexico Blue 991 in front of it. This was just too damn cool. Copper plated everything, and amazingly clean black paint. We eventually departed for lunch, with a few more cars joining this time. And all parked up. 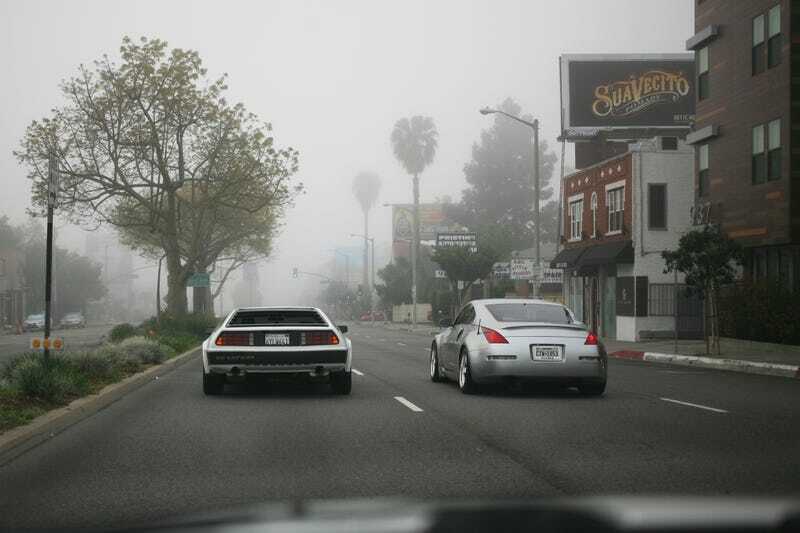 The DeLorean makes the Z33 look massive.